Hawaii Native Status: Introduced. This naturalized Polynesian canoe plant is native to Southeast Asia. Flowering Season: It flowers throughout the year. Description: The flowers are tubular and have 5 lobes with pointed tips. The flowers emerge from the tops of the developing compound fruits. 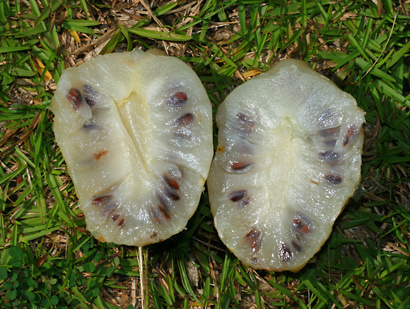 The ripe fruits are a translucent whitish to yellowish white color. The leaves are shiny green, up to 1 foot (30 cm) long, and rounded to oblong in shape. The branches are tetragonal (4-angled) in cross section with rounded angles. 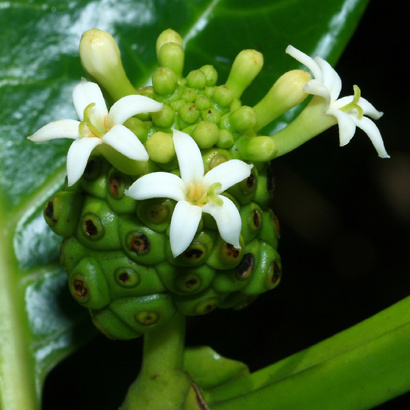 Canoe Plant – This plant was originally brought to Hawaii by the ancient Polynesians in their canoes. The fruit was used for medicinal purposes (as it still is today) and as a famine food of last resort. The root was used to make yellow dye, while the bark was used for red dye. 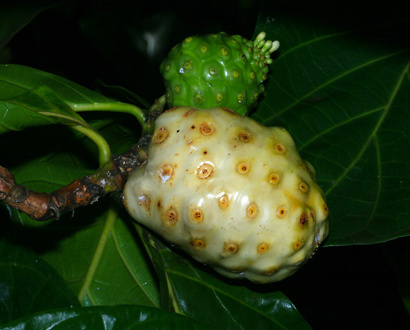 Edible – Noni fruit is edible, but it's very foul-smelling. The much more palatable processed and/or blended fruit juice is used in a variety of health drinks and other natural health products. Foul-smelling – The ripe, white fruit has a nauseatingly bad smell, very much like fresh vomit mixed with rancid garbage. Avoid smelling it if you have a weak stomach.